Events are a great way for delegates to meet agency staff, broaden their network by meeting other attendees, and to find out about the latest legislation and ways to comply. We take seriously our responsibility to provide guidance and support to ensure that we are collectively contributing to the public health agenda through good practice guidelines. 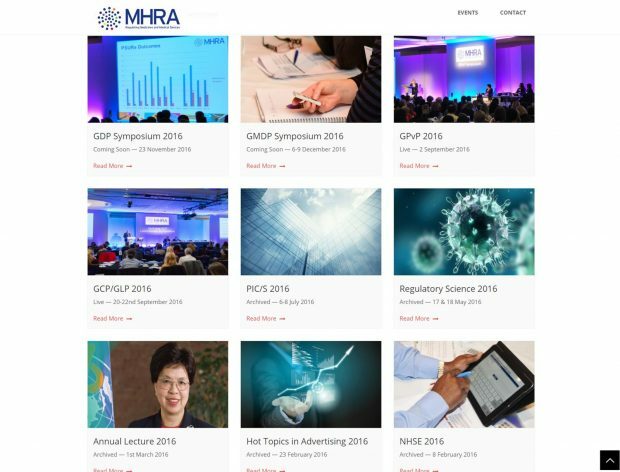 Our events receive really positive feedback from delegates with a typical score of 95% satisfaction rating and our symposia are also often oversubscribed - including Good Pharmacovigilance Practice (GPvP) and Good Manufacturing & Distribution Practice (GMDP). As well as providing attendees with the right information at these events, we also want to make sure that their experience is memorable and enjoyable. We asked delegates what they like about our events and what they would like to see improved - the results were really interesting! Using surveys, we have established that people value the opportunity to engage with us and 'put a face to the name'. Also, interactive elements to our presentations are ranked highly and attendees said they would like to see more of this. Sadly, not everyone can attend one of our events, as they fill up quickly or their diaries are too jam-packed. We want to find new ways of helping people access our events, even if they work abroad. Wherever possible, we accommodate additional guests until we've reached the absolute maximum capacity. However, we have been looking at ways to include more people by offering alternative options like viewing a live broadcast of presentations in real time and having access to materials. This will enable all four corners of the world to join us virtually, watch presentations, participate in live polls and submit questions to speakers. The ability to participate in polls and answer questions will soon be available through our new event app, which is due to launch ahead of the GMDP Symposium in December 2016. The app will also give delegates the power to download presentations straight to their phone, tablet or laptop and network with other delegates before, during and after the event. To build upon the networking ability of the new app, we are developing an online hub where delegates can carry on the conversation post-event with people they have met. They will also be able to find all our other events in one place and search for the subjects and themes that interest them the most. Combining these tools will make it easier for people to get involved and help us to reach a broader audience with our important messages. By providing a community around our events we hope that the experience of delegates will be even more memorable and enjoyable.